...it’s gorgeous – thank you..
LoveMyDog’s studio muse Rabbit has made the press once again and was featured on the home page of the Mail Online today. If you are looking for the finest in bespoke canine couture then we are always delighted to welcome you and your dog for a bespoke fitting for a dog coat, matching lead and collar or something more creative. We have designed outfits for dogs with feathers, sequins and even a bridesmaid’s dress for a very special wedding. However, we would ask that you make an appointment so that we can make sure we can give you and your pet the time you deserve. Just call on +44 (0)207 739 4237 or email studio@lovemydog.co.uk. 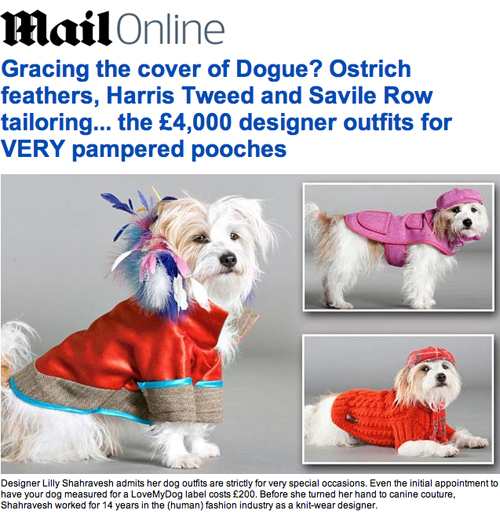 You can the Mail Online article here or browse LoveMyDog’s range of canine couture here.